This is called an architectural drawing, but is it really? To look at it, the architecture seems almost spectral, while the landscape pulses with vitality. We are used to thinking of architectural drawings as prospective — putting to paper a structure that does not yet exist, detailing precise instructions for its realization. There is, of course, a long tradition of visionary drawings whose features will never be actualized in three dimensions. But Solomon’s work is something else again: studies of existing buildings where the primary concern is not the building in itself, but rather the integration of a structure into its site, into a landscape. These drawings bring new emphasis to architecture as a topographic feature, just as they seek to reveal the perception that site itself — the grid of fields, their rigid furrows — is a “built” environment. Landscapes like this are profoundly un-natural; although some of their features, such as the meandering stream in the distance, retain some character of the haphazard and unconfined, the rest of the highly manipulated flora makes up what Solomon would call green architecture. 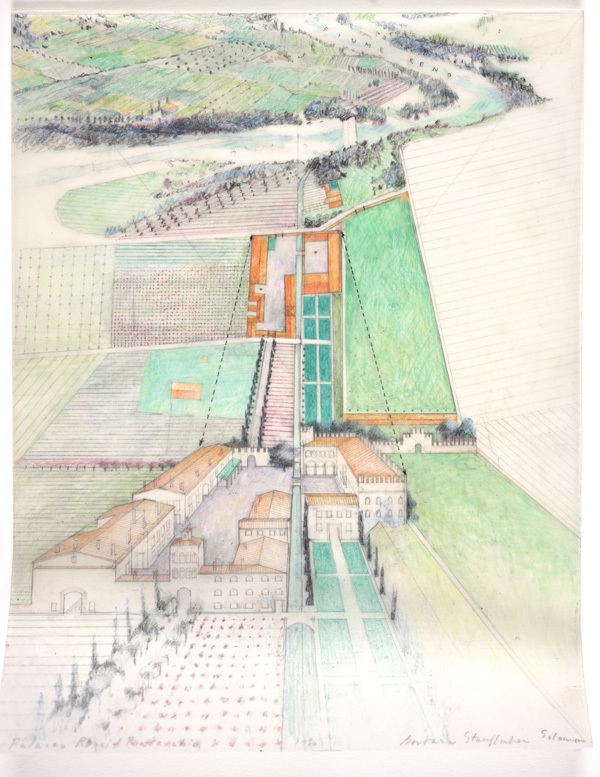 Her book Green Architecture and the Agrarian Garden, in which this drawing appears, focuses on these unstable margins between built and unbuilt. I am drawn to this work because of the way the buildings seem not so much like places to live, but alive themselves, part of an ecosystem, embedded among growing things. My own grandfather, an architect of a more pragmatic strain, used to call architecture a practice of “environmental expression.” Solomon’s approach gives primacy to the environmental context and to a rich perception of place as returned to repeatedly over time. She creates densely layered views of multiple perspectives simultaneously, as in this image, where the palazzo is seen on approach, then in plan from above in a bird’s-eye view. I find that looking at it once and then again, pausing to reconsider it, is like hearing an unexpected echo, one that puts my first perception in question. I toggle between the rigidity of tree-lined lanes, green rectangles of garden, the orderly agricultural geometry, and the dreamier evocativeness of stream and vegetation in the background. The multiple perspectives invite different kinds of viewing: aesthetic contemplation, the eye of the tourist, then formal analysis, the eye of the cartographer. This technique of drawing renders the formal specificity of a site and yet provides an experiential mapping of place through time. No one else draws like this. I asked Solomon once where she learned this technique, and she replied, “I didn’t” — meaning that no one teaches you this in architecture school. It developed out of her unique trajectory: having started her career as a graphic designer, she gained renown for creating building-scale graphics for the Sea Ranch development and other projects, then abandoned that course to study architecture and committed herself to landscape design. The hard-edged graphic style she had developed in her Swiss training persists in her exacting attention to line, but there is also softness and generosity — an architectural drawing that gives more than what’s asked for. Much in it remains elusive — how does this building function? Who occupies it? What stories does it tell? — yet it offers an intuited and evocative portrait of the different modalities in which humans shape a particular place. Erin Hyman is a writer, editor, and sometime curator. Her cultural commentary on topics from wine to Oscar Wilde can be found in journals, essay collections, and blogs, and she is contributing to a forthcoming book surveying the history of architectural installations.